Users will not only be able to store files in the bracelet, they will also be able to boot an operating system installed in the drive when it’s plugged in to a Mac or PC. 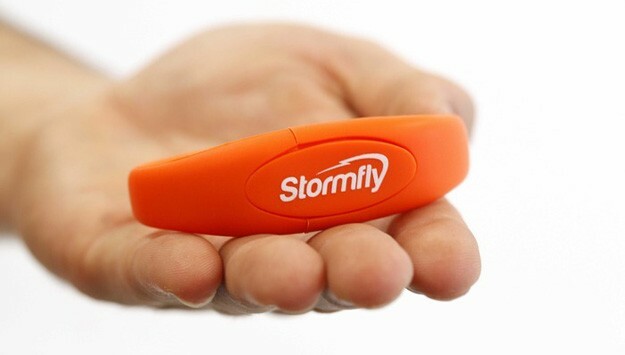 The bootable function of the StormFly bracelet is activated when you plug it into a 64-bit Mac or PC. The computer will automatically boot from the USB bracelet, temporarily replacing the OS of the host computer with the USB’s system. This function is especially handy when you have to constantly switch between computers while having to access specific programs. Instead of having to download programs to different computers every time, the StormFly bracelet makes life a lot easier by anchoring all data into a flash drive with its own OS. The USB bracelet comes in two colors, orange and black. Unfortunately, it can’t be bought just anywhere just yet – though that is the eventual goal. For now, the StormFly USB bracelet is a Kickstarter project that needs some capital before production can start. The current amount needed for the first production is about $100,000. That means that each individual who wants one must pledge at the lowest $59 on Kickstarter. This base pledge sum will has some decent mileage for the user, too. First off, you get to have a StormFly USB bracelet. Second, you will be able to avail three months of backup service free of charge. Though it’s a long way from reality, StormFly eventually wants to offer its USB bracelet as an accessory for kids and their parents that will keep kids from losing USB flash drives and the data (sometimes incredibly important) stored in them. This entry was posted in Stormfly, USB Bracelets and tagged Kickstarter, Stormfly, USB Bracelet, USB Flash Drive. Bookmark the permalink.